Note: this blog has been updated to reflect the Tax Foundation's corrected growth and revenue numbers. Recent dynamic estimates of the Tax Cuts and Jobs Act (TCJA) show that, regardless of the economic model used, the House tax reform bill will add to the national debt while only modestly improving economic growth. A new detailed dynamic score from the Penn Wharton Budget Model (PWBM) found that the TCJA would increase the average annual growth rate by between 0.03 and 0.08 percentage points over a decade and generate between $140 billion and $367 billion of dynamic revenue (net dynamic savings would be even less when spending effects are included) – not nearly enough for the tax bill to pay for itself. 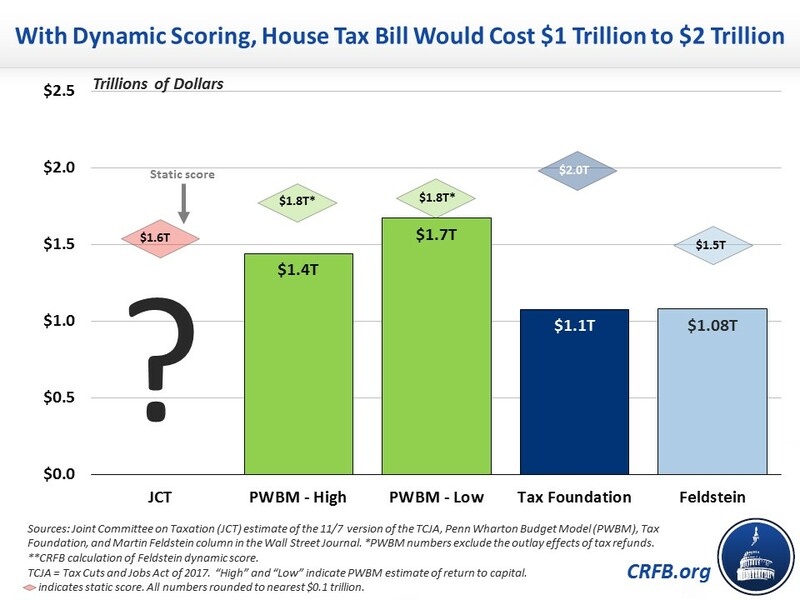 Based on PWBM's estimates, the House tax plan would still add over $2 trillion to debt, even before accounting for gimmicks and false expirations. While the PWBM study finds that tax rate reductions and other reforms in the TCJA would be pro-growth, the additional debt the bill adds would serve as a drag on economic growth. Although policymakers have justified a $1.5 trillion tax cut under the argument it would be paid for with economic growth or even reduce deficits, yesterday's study shows this assertion to be untrue. The Penn Wharton Budget Model estimates that the TCJA has modest pro-growth effects, boosting Gross Domestic Product (GDP) after ten years by between 0.33 percent and 0.83 percent (roughly equal to a 0.03 or 0.08 point boost in the average annual growth rate). This growth effect is enough to reduce the TCJA's ten-year revenue loss by 8 to 20 percent and reduce the ten-year debt impact by only 2 to 8 percent. Even under dynamic scoring, the plan would reduce revenues by $1.4 trillion to $1.7 trillion over a decade and add between $2.0 trillion and $2.1 trillion to the national debt. Much more bullish estimates from the Tax Foundation – which ignore the economic cost of higher debt – also show the House tax bill will significantly add to deficits even after dynamic effects are considered. And a rough estimate from former Chairman of the Council of Economic Advisers Martin Feldstein also implies significant new debt under the House bill. No study to date suggests the TCJA can increase economic growth by the 0.4 percentage points per year claimed to offset the plan's cost by Senate Majority Leader Mitch McConnell (R-KY), let alone lift the annual growth rate to 2.6 percent as assumed in the budget resolution or 3 percent as assumed in the President's budget. Based on PWBM growth estimates, tax reform might boost the real GDP growth rate to 1.9 percent over the next decade. Even under estimates from Feldstein and the Tax Foundation – both of which ignore the negative effect of higher debt – economic growth would remain between 2.0 and 2.2 percent. While no estimates to date find that tax reform will pay for itself with growth, estimates that show large growth effects generally look at the positive impact of lower rates without considering the negative impact of rising debt. Indeed, the Tax Foundation effectively assumes an unlimited supply of savings so that any increase in debt is fully offset by increases in domestic savings and foreign investment. The PWBM and Congressional Budget Office (CBO) models also assume rising debt leads to higher domestic savings and foreign investment, but a portion of the higher debt comes at the expense of ("crowds out') private investment. For instance, CBO believes every $1 in additional deficits crowds out $0.33 in private investment. 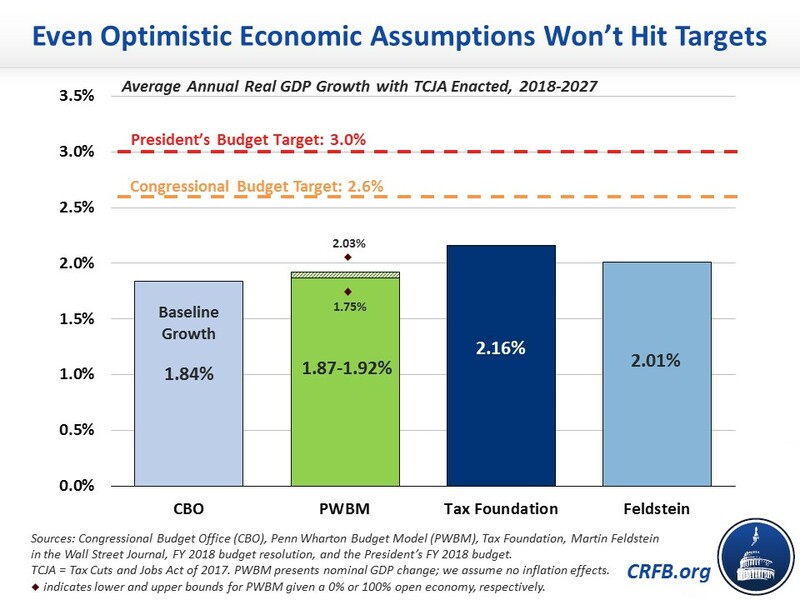 Evidence suggests the PWBM and CBO models paint a more accurate picture of the economy, and even Tax Foundation admits some crowd out of investment would occur as deficits rise. Importantly, the negative effects of debt grow over time. Under the PWBM model, the House bill actually hurts GDP growth after 2027 – they estimate a 0.03 to 0.05 percentage point reduction in average growth between 2028 and 2040. As a result, they estimate the economy will be somewhere between 0.41 percent larger and 0.25 percent smaller in 2040 under the House tax bill as compared to current law. PWBM's results confirm the findings from many previous studies: a tax bill financed by adding more to the already unsustainable national debt will actually have slower growth than one that does not add to the debt. Tax cuts do not pay for themselves, even after assuming higher economic growth as a result of them. Adding $1.5 trillion to our already unsustainable national debt path is a step in the wrong direction. In order to reduce the bill's cost, lawmakers should either scale back the bill's tax cuts, add more base broadening, or identify other offsets to make it more fiscally responsible. Sources: Joint Committee on Taxation estimates of the 11/7 version of the Tax Cuts and Jobs Act, Penn Wharton Budget Model, Tax Foundation, Tax Foundation staff, and Martin Feldstein column in the Wall Street Journal. Annual growth rates are CRFB calculations assuming growth occurs linearly over the ten-year window. *PWBM numbers exclude the outlay effects of tax refunds, which are included in JCT's numbers. Using JCT's conventions, the PWBM conventional score is $1.75 trillion. **Feldstein did not give a dynamic score, but CBO rules of thumb (before interest effects) imply a dynamic score around $420 billion.